I would have thought that skydiving from 14 000 ft, scuba diving with sharks, or surfing with large waves, might have been one of my scariest adventures. However, it was bungee jumping that I have found the scariest. 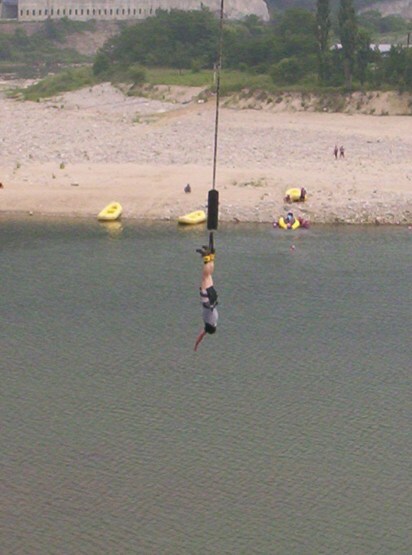 In Inje, South Korea, we decided to do our first ever bungee jump! The jump was only about 60 meters. I am not afraid of heights, so at the time I was just super excited to try this new adventure. I was told to walk off the ledge and just drop on the count of 3. Below me I could see nothing but water. It seemed like a fairly long way down. I told myself not to think about it too much and just do it! And that is exactly, what I did. That’s me, doing my first bungee jump! Jason keeps spinning upside down, after his first bungee jump! Now, when I recall my experience, I keep thinking I cannot believe that I actually jumped. The scariest part is voluntarily stepping over the ledge and losing all control. Interestingly, bungee jumping, has been the scariest yet most thrilling adventure for me! Bungee jumping is really awesome fun and everyone should try it at least once. But now that I have experienced it, it is the one activity that I would honestly hesitate to do again. Why? The thought of jumping over a ledge and ending up upside down in the air is quite terrifying!